Over 400 people gathered for the Cork County Scout and Guide pre-Christmas service in Saint Fin Barre’s Cathedral on Wednesday night last (4th December). Children and young people from Scouting and Guiding organisations from all over Cork County brought along toys for distribution by St Vincent dePaul Cork (Ballinlough area and Bandon area) and the Cork Lions Club and for the Children’s Ward of Cork University Hospital. The Dean of Cork, Very Revd Nigel Dunne presided and was assisted by Fr Dave Kenneally (Scouting Ireland Chaplain). 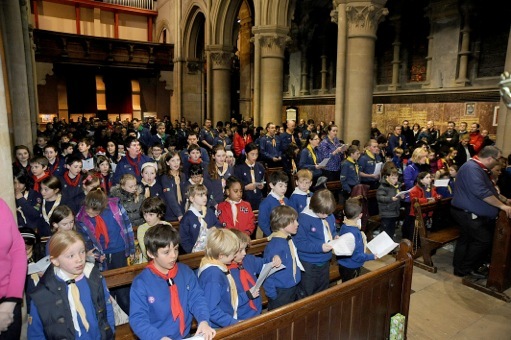 Readings and prayers were led by Cubs, Scouts, Brownies and Guides and hundreds of toys were presented at the High Altar at the end of the service. This entry was posted in Cathedral, Children's Work, Christmas, Church Services, Youth Work. Bookmark the permalink.